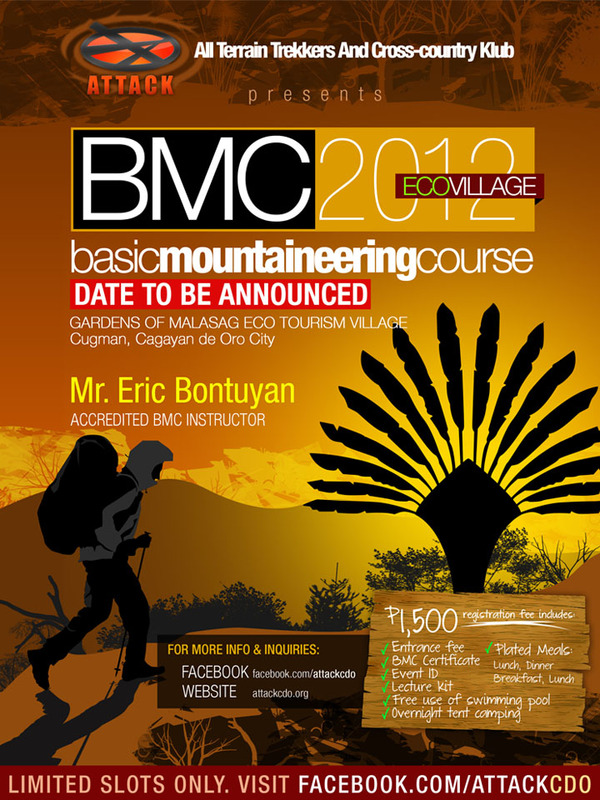 ATTACK will be hosting Basic Mountaineering Course this coming July 21-22 2012 at Gardens of Malasag Eco Tourism Village in Cugman, Cagayan de Oro City. Basic mountaineering course to introduce leisure activities to the novice mountaineer, along with the basic rudiments and skills of the activity, the course shall stress key concept in fitness and safety. To develop the participants appreciation for nature and awareness of sound conservation practices through practical experiences. To develop desirable qualities of character such as resourcefulness and creativity that can be drawn out of trying situations brought about by the outdoor experience. To develop physiological fitness through progressive exercise. To provide a venue for individual satisfaction and enjoyment through different outdoor pursuits. Basic Mountaineering Course outline will be discussed by one of the accredited BMC instructors in the country, Mr. Eric Bontuyan. Proprietor – Viajero Access Solutions Phils. Limited slots only. If you’re interested to join, please click here to sign up. For updates, please Like our Facebook fan page and you can post inquiries through our Facebook fan page.